Technology, in our world, is evolving at a rapid pace. We started with black and white televisions, and not even 100 years later, we find ourselves immersed in a world full of advanced technology that we simply couldn’t have predicted. Even electronics we purchased a few years ago are no longer current, so we begin building more products in order to cater to those older products. Bluetooth transmitters are one such example of merging old with new. A Bluetooth transmitter enables us to connect our non-Bluetooth electronics with items that are. For example, you connect a Bluetooth device to the transmitter, then plug the transmitter into something that has no Bluetooth capability. This enables you to watch or listen to whatever is available on the Bluetooth compatible device. They can even be used to receive phone calls in the car – such is the convenience on offer. If you’re in the market for such a revolutionary device, consider one of the nine below. 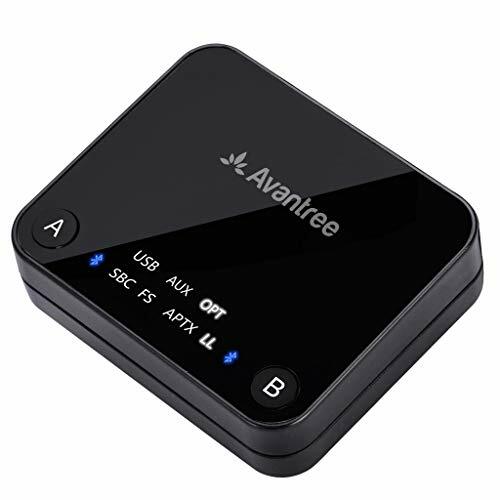 If you’re looking for a cost-effective way to achieve a long-range Bluetooth transmission between home audio sources, this Avantree Bluetooth Transmitter could be the answer. Not only is it priced competitively on the market, but it can reach up to 164 feet in line of sight, or 50 to 70 feet indoors. This well and truly surpasses many other Bluetooth transmitters on the market. There are also many other reasons why this transmitter is number one on the list. It can be used to stream music to your Bluetooth headphones and speakers, it can act as a pass-through hub for wired connections, and users can experience no lip-sync delay with aptX low latency-supported devices. There’s every reason to believe this transmitter will tick all the boxes for you and your family. Your safety is paramount when you’re driving, so why not invest in technology that enables you to answer the phone without picking one up? This TaoTronics Bluetooth transmitter can safely answer or hang up phone calls when you’re behind the wheel, all with the click of a button, and the mic function in RX mode. 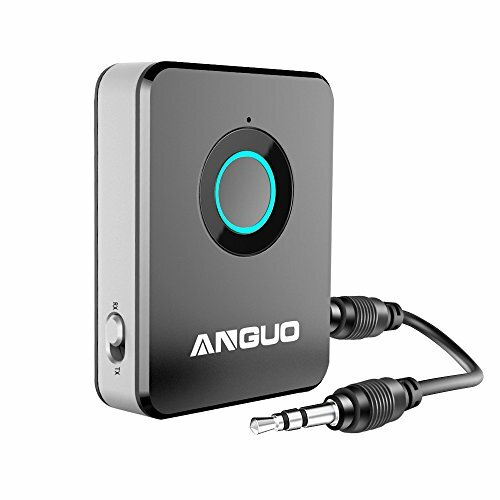 This Bluetooth transmitter is also multi-functional, allowing you to stream audio to Bluetooth headphones and speakers, as well as receiving audio from computers, tablets, smartphones, and iPads as well. With a 65-foot reach, it’s convenient for both indoors and outdoors and will prove popular with any family looking to expand their Bluetooth connectivity at home. Not all electronics you own will have Bluetooth functionality, especially if they are older than five-years-old. Thankfully, this TaoTronics Bluetooth can turn TVs, PCS and any audio device deficient in Bluetooth capability into electronics that do. Even though we’ve come a long way where technology is concerned, some devices still need Bluetooth transmitters in order to take advantage of all the features on offer. While it can’t pair with phones or tablets, this transmitter has a decent 33-foot range, and can wirelessly transmit audio anywhere, at any time, to most non-Bluetooth devices. 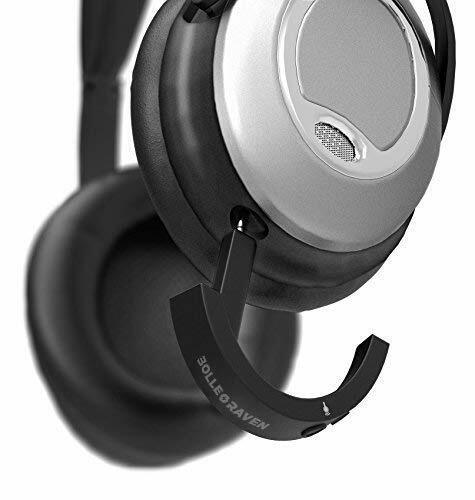 It offers stunning sound quality, is easy to pair up, and can provide 7-8 hours of continuous playtime. For the price, you sure do get a lot of bang for your buck. This cost-effective receiver is compatible with most smartphones for your convenience. While it can’t transmit signals, it can only receive them, it’s suitable for most home or vehicle audio systems. It can double link to two Bluetooth devices at once, is ideal for music, GPS, or phone calls, and is easy to navigate with simple buttons. You can even use this receiver to activate Siri on Apple devices or skip music tracks with ease. It’s the ultimate car friend everywhere you go! If you compared the features and 10 hours of talk time on offer in comparison to the price, it’s also one of the most cost-effective options. Therefore, there is every reason to believe this receiver is one of the best on offer. Unlike most other transmitters on the market, this VicTsing transmitter boasts universal compatibility. This means that it doesn’t matter whether you’ve got an iPad, iPod, iPhone, or another Bluetooth-enabled device, you will be able to play music or take calls with ease. It features a large screen to show you who’s calling, or what song is playing, and it’s easy to play music from a microSD card or USB disk. 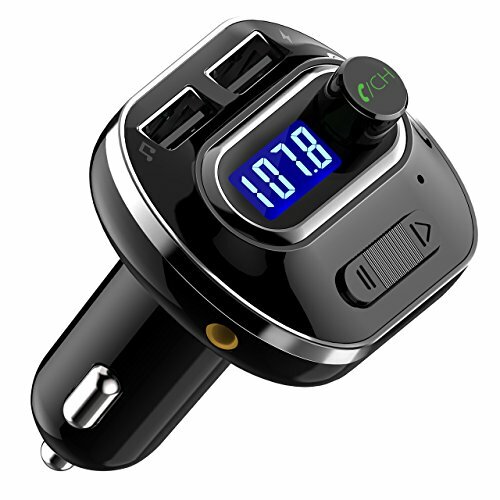 It’s easy to set up, easy to use and suits any vehicle with a cigarette or 12-volt plug very well. 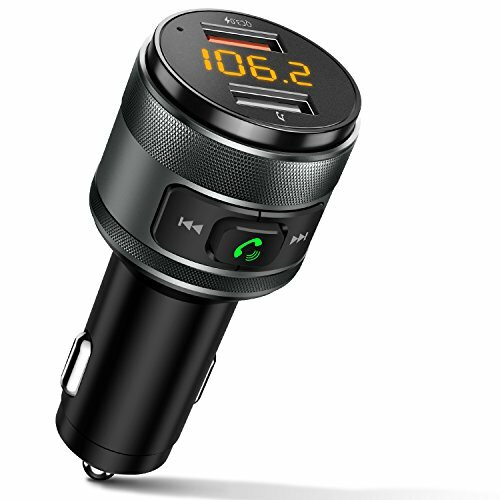 The best part is, it’s priced exceptionally competitively on the market, giving other Bluetooth transmitters a run for their money in both features and value. 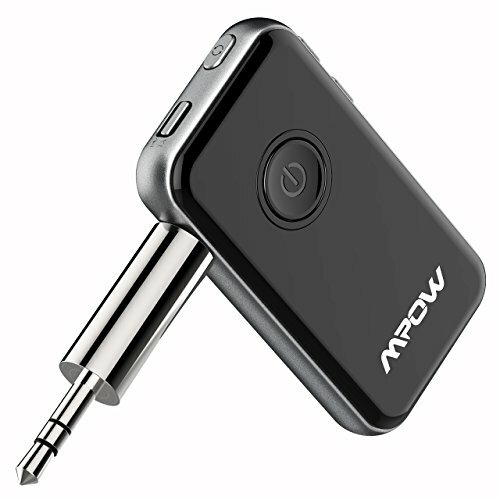 This multi-functional Mpow transmitter and receiver is worth its weight in gold. 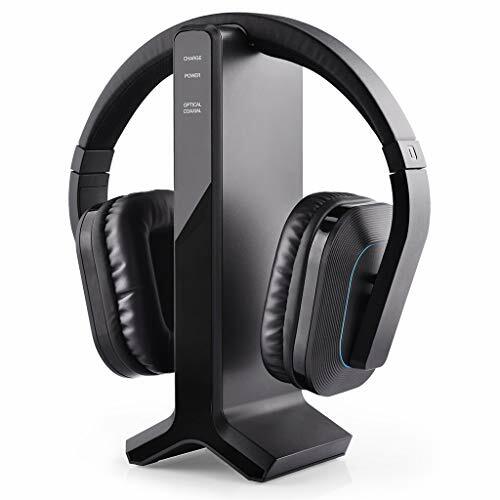 You can pair it with both headphones and speakers that are Bluetooth-compatible, before being plugged into a non-Bluetooth TV, or other media device, via the 3.5mm audio cable, or an RCA cable. This in itself is convenient. However, it can also connect to two Bluetooth devices at once, all the while allowing you to take calls when put in receiver mode. Even those who aren’t tech-savvy will appreciate how convenient this transmitter is. Not only does it boast a range of excellent features, but it’s very easy to set up and use at any time. There is so much to love about this transmitter, and it’s a favorite with many consumers around the world. This TaoTronics Bluetooth transmitter offers the latest 4.1 software, and can pair two pairs of headphones, or two speakers, at the same time! 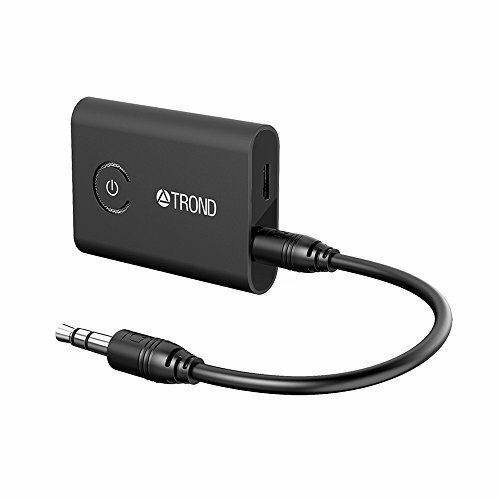 It provides superior levels of convenience with support for both AUX and RCA and supports input and output, as well. 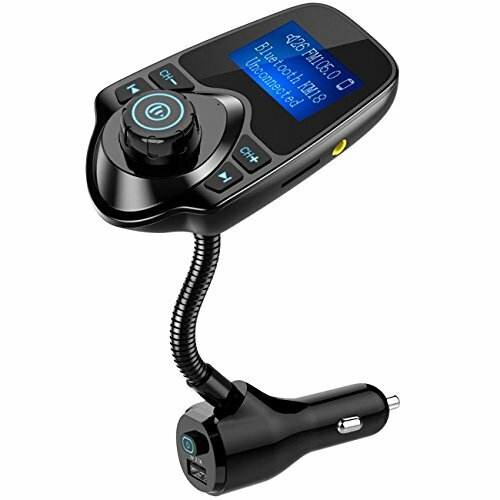 Unlike many other Bluetooth transmitters on the market, this one also offers low delays and provides constant streaming and automatic re-pairing time and time again. No longer do you have to put up with audio and visual elements being out of sync! Enjoy cable-free roaming, and revitalize your media sessions with this high-quality transmitter. If your media center is the life of the party and needs to remain consistent, you need a Miccus Inc Bluetooth Transmitter/Receiver. This device is designed perfectly for an entertainment center, and is suitable for use with Echo Alexa, Google Home, Kindle Fire, Mp4, CD, Nintendo, PS3, PS4, 3.5mm input/output, and more! It offers automatic pass-through, dual streaming, no audio delaying, and a long range. In fact, this transmitter provides 160 feet of perfect audio Bluetooth capabilities with not even a slight delay! If you’re an entertainer and you want your transmitter to blend in with your other entertainment equipment, this Miccus Transmitter/Receiver will tick all the boxes for you. This transmitter boasts the title of being the first dual-link low latency transmitter. It can stream audio to two sets of headphones, offers no lip-syncing delays, and is suitable for watching tv, playing movies, or putting music through speakers. Aside from the flexibility on offer with devices, this transmitter also has an auto-reconnect feature to connect to the last two paired devices automatically and offers an extended range of up to 100 feet. Very few transmitters or receivers on the market can offer such a feature, which makes this product highly sought-after. Chargeable via USB as well, it’s one of the most convenient and easy-to-use transmitters on the market.